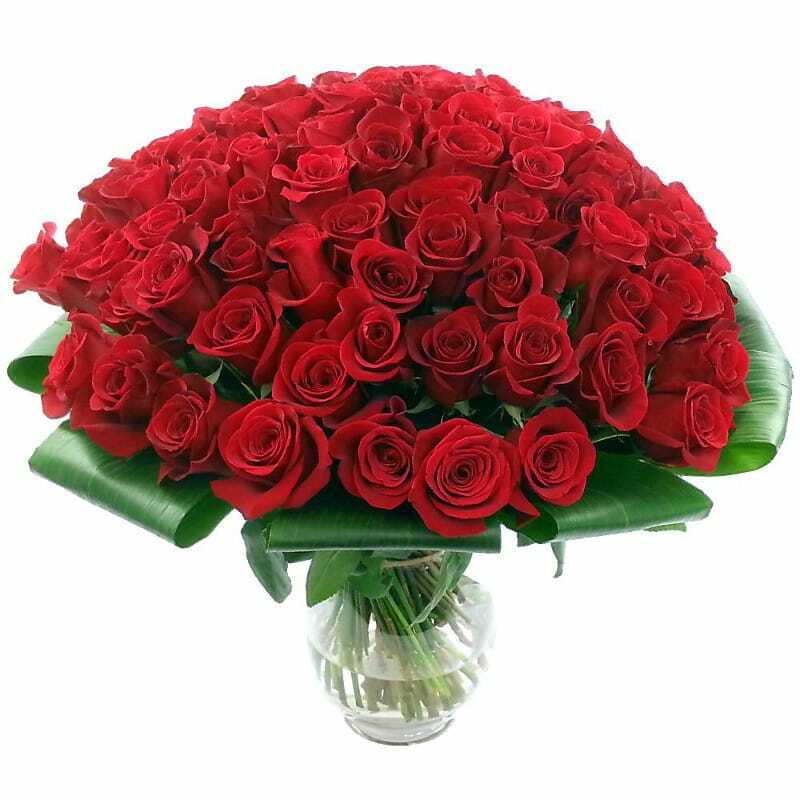 100 red roses flower delivery in the UK by Clare Florist. Our biggest and best rose bouquet yet! We've really outdone ourselves this time with our bountiful 100 Red Roses Bouquet - if we do say so ourselves! Universally renowned as a symbol of romance, passion and love, Roses are the obvious choice when you want to convey to the object of your affections just how much they mean to you. Whether you are looking to woo a workplace crush or remind your partner how special they are to you, our 100 Red Roses will make for a bold statement indeed. The roses themselves are arranged amidst luscious green aspidistra leaves, creating an eye-catching contrast that compliments the flowers whilst further emphasising their natural beauty. For a unique touch, why not add a Handwritten Greetings Card into which we will add your personalised message. Or go ahead and spoil your loved one with a delicious box of Lily O'Briens Chocolates. You can also add a cute and cuddly teddy to accompany your 100 Red Roses bouquet. Rose lovers may also be interested in the original inspiration for the above bouquet, the Love 20 Red Roses Bouquet. You might also find inspiration in the True Romance Bouquet which is comprised of a dozen elegantly arranged red roses. We have a wide selection of romantic Valentines Day Bouquets, remember - these arrangements needn't necessarily be sent on Valentine's Day itself, you can find inspiration for your romantic gestures all year round! If time is of the essence and you need to send 100 Red Roses today, be sure to take a look at our full range of flowers for same day delivery for more ideas and inspiration.